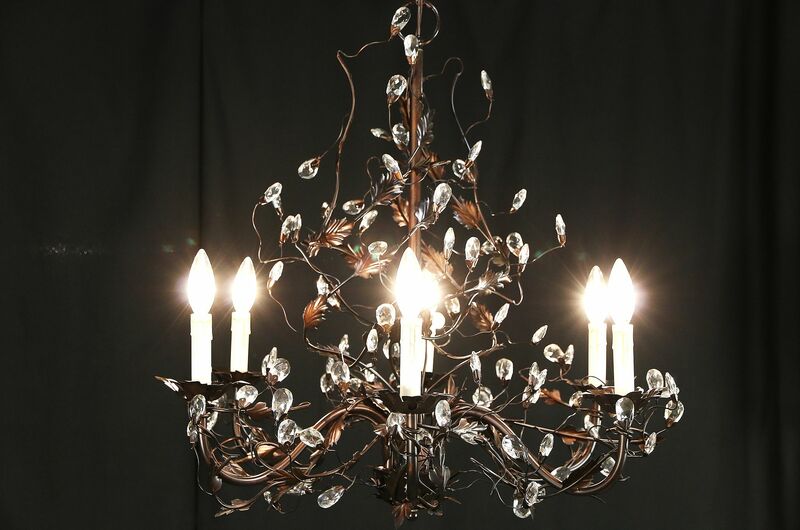 A six candle chandelier in lacy wrought iron and tin has a vine motif and cut crystal prisms. About 10 years old, the original dark "statuary bronze" finish is in excellent condition. Sockets have "drip" candle covers and fit standard candelabra base bulbs, not included. Measurements are 25" diameter and 27" tall, not including the adjustable chain and ceiling cap. Please view 9 photos at full screen size for best detail. Matching chandelier priced separately, contact us for availability.